The foundation of the Maritime Spatial Planning is created by the overview of the current state consisting of several different reports. Based on the current state, the maritime spatial planners have drafted future scenarios for the marine area with Capful Oy in the lead and in co-operation with stakeholders during this winter and spring. You can give feedback on the overview of the current state and the scenario drafts between 10 April–10 May. You can find the materials and the link to the digital feedback form here. The consultation of the first phase of the Maritime Spatial Planning will be organised during 10 April–10 May 2019. Based on the hearing and regional future workshops, the preparation work of the actual plan drafts will be started. The consultation material consists of the preparation phase’s reports on the current state and the draft of the future scenario on national marine areas. A key part of the overview of the current state is the Status of Finland’s marine environment 2018 publication created as part of planning the marine strategy. The consultation of the Maritime Spatial Planning is not a statutory statement procedure, but it is done to collect views as background material for the planning. The work will continue in May–June by drafting the regional future scenarios together with stakeholders. The future scenarios define the direction for creating the maritime spatial plans. You can find the schedules and locations of the regional future workshops here. The aim of the scenario work is to define the most probable future scenarios and evaluate their impacts. This way, the foundation is created for the objectives, “roadmaps” and planning reservations to be defined in the maritime spatial plans. 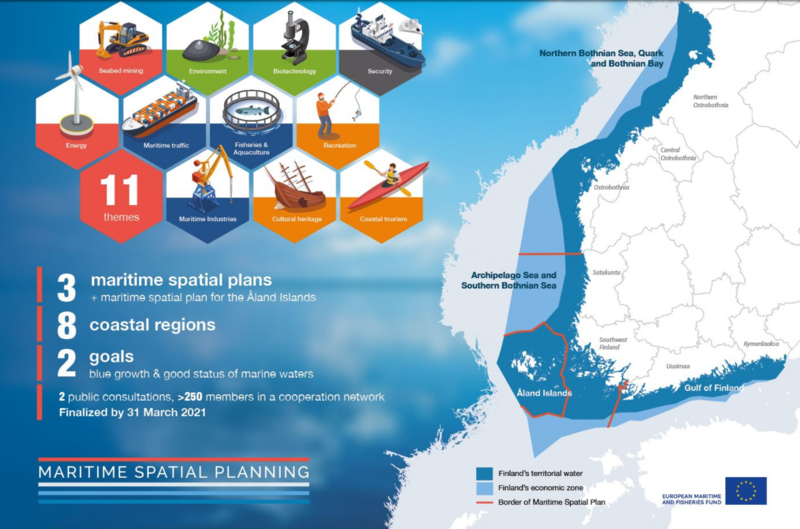 Maritime spatial plans are the vision of the guidelines regarding the future use of marine areas to be created by the regional councils of coastal Finland and the Åland Islands in cooperation with stakeholders.